Scott Pendlebury motors through the centre during his 42-possession performance against Adelaide in round 16. Collingwood’s Scott Pendlebury has capped off a stellar home and away campaign by being crowned the AFLCA’s Champion Player of the Year. The three-time All-Australian finished one vote clear of Gold Coast’s Gary Ablett to win the award, with Joel Selwood of Geelong placed a vote further back. Sitting third entering the final fixture of the season, Pendlebury’s virtuoso display against North Melbourne on Sunday saw him collect nine votes surge past Selwood and round 22 leader, Sydney’s Kieran Jack, to be named 2013’s leading player by competing coaches. Given the implied tacit acknowledgement by opposition coaches that a player managed to foil efforts to curb their influence, the AFLCA Champion Player of the Year remains unique among the host of end of season awards on offer, and one which Pendlebury admitted he was honoured to receive. 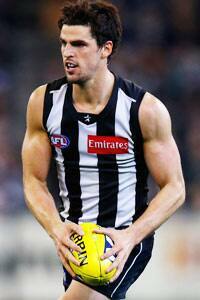 “It’s a good award to win and I think all the players hold it in pretty high regard,” Pendlebury said. Having recorded career highs in average disposals and clearances this season, Pendlebury has maintained the remarkable trajectory which has seen the former number five draft pick emerge as one of the leading players in the game. With a Premiership, Norm Smith Medal, multiple All-Australian selections and Copeland Trophy already in his keeping, Pendlebury’s decorated 170-game career places him among exalted company. However, quite remarkably, at only 25, the Gippsland native still has his best years ahead of him. But driven by a burning desire for further team success, Pendlebury certainly couldn’t be accused of naval gazing; admitting he likely won’t be able to truly appreciate his individual accolades for some time yet. “(I will be able to reflect) more so at the end of the season and probably even at the end of your career you will appreciate (individual awards) more but while you’re playing it’s all about trying to win a premiership and team success,” he said. “All my goals are based around how the team is going. I don’t think I have broken it down individually yet and won’t until the season finishes. Pendlebury becomes the third Collingwood player to claim the AFLCA prize following current coach Nathan Buckley (2003) and team mate Dane Swan (2010).